The food-in-a-box concept is growing as fast as a green pea plant in the spring sunshine. 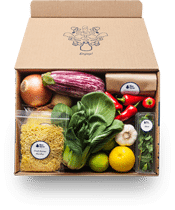 There’s a gaggle of meal delivery concepts in market—Hello Fresh, Sun Basket and Purple Carrot to name just a few—that make it simple for the busy professional to prepare a meal. Customers select recipes and then the ingredients and step-by-step instructions are quickly delivered right to their doors. The problem for marketers promoting these services is that they all lookalike, making it difficult for one brand to distinguish itself from rest of the food-in-a-box pack. Meal delivery service Blue Apron has found the challenge “exciting.” Greg Fitzgerald, the director of acquisition marketing, spoke with The Drum about how it has found success by testing new marketing platforms, like podcasts, and by working with influencers, including Olympic Gold Medalist Michael Phelps. Customers are playing their part as well, by producing UGC-style videos of themselves preparing Blue Apron meals that may then be used in marketing. Total brand spending on influencer marketing was projected to reach $81.3 billion last year, up 6.7% from $76.19 billion in 2015. Approximately 37% of influencer marketing is outsourced to media companies with B2C clients accounting for more than 84% of budgets. Social media is the fastest growing influencer-marketing channel, besting word-of-mouth, PR and customer service and telesales, according to a ANA/PQ Media study.